This example shows how you can use PROC GAMPL to perform scatter plot smoothing. 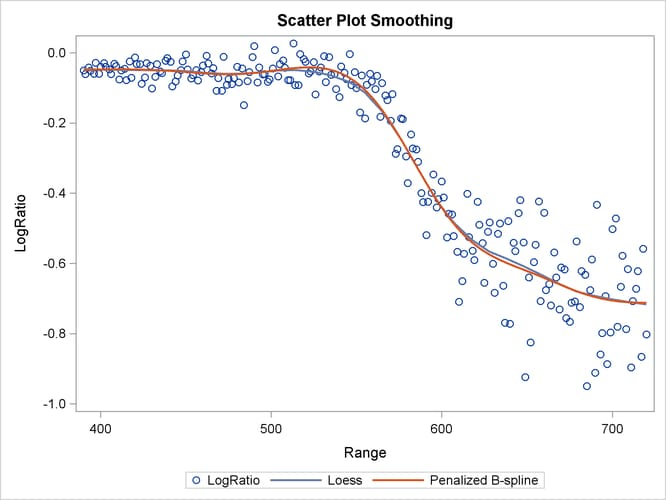 Output 42.1.1 shows the scatter plot of Range and LogRatio and the smoothing curves that are fitted by local regression and penalized B-splines smoothing techniques. The “Specifications for Spline(Range)” table in Output 42.1.2 displays the specifications for constructing the spline term for Range. The maximum degrees of freedom is 10, which sets the upper limit of effective degrees of freedom for the spline term to be 9 after one degree of freedom is absorbed in the intercept. The order of the derivative in the penalty is 2, which means the unpenalized portion of the spline term involves polynomials with degrees up to 2. The “Fit Statistics” table in Output 42.1.3 shows the summary statistics for the fitted model. The “Estimates for Smoothing Components” table in Output 42.1.4 shows that the effective degrees of freedom for the spline term of Range is approximately 8 after the GCV criterion is optimized with respect to the smoothing parameter. The roughness penalty is small, suggesting that there is an important contribution from the penalized part of thin-plate regression splines beyond nonpenalized polynomials. Output 42.1.5 displays fit summary statistics for the second model. The model fit statistics from the second model are very close to the ones from the first model, indicating that the second model is not much different from the first model. Output 42.1.6 shows that the effective degrees of freedom for the spline term of Range is slightly larger than 8, which is understandable because increasing the maximum degrees of freedom expands the functional space for model searching. Functions in the expanded space can provide a better fit to the data, but they are also penalized more because the roughness penalty value for the second model is much larger than the one for the first model. This suggests that functions in the expanded space do not help much, given the nonlinear relationship between Range and LogRatio. The fit summary statistics shown in Output 42.1.7 are close to the ones from the previous two models, albeit slightly smaller. As shown in Output 42.1.8, the effective degrees of freedom for the spline term where polynomials with degrees less than 4 are allowed without penalization is 8. The roughness penalty is quite small compared to the previous two fits. This also suggests that there are important contributions from the penalized part of the thin-plate regression splines even after the nonpenalized polynomials are raised to order 3. 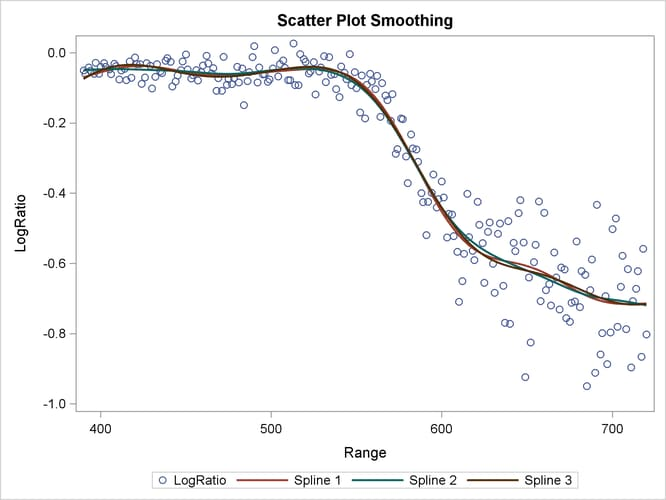 Output 42.1.9 displays the scatter plot smoothing fits by PROC GAMPL under three different spline specifications.